Decorated and applied handle to special order mug. Handles are finicky, but this one went well. I may have to make more of these mugs; it's officially my first "handled" mug to also feature signature sgraffito work. I'll get a picture up of this one later. Decorated small bowl - this one was trimmed on Tuesday, so it was ripe and ready to be decorated. I've attached a picture of the process below. Decorated plate - this one is 14.5 inches across, and I'm pretty pleased with the way it has turned out thus far - it's very similar to a series of plates I did for my Senior Project, which can be seen here. Here's a posed photo of my hand decorating the plate, and finished. Yet to do with the plate: trim, dry, fire, glaze, and fire again, all without inducing cracks or warps. I can do it. Yes, I can. Trimmed and decorated medium bowl - this is the smaller of the two originally seen here. That's 12 inch bat it's sitting on, so it's a decent sized bowl at the moment - probably 9 inches across, 9 or 10 inches tall. It will shrink before it's finished (10-15% shrinkage - don't know the exact stats on this clay body), which is one of the side-effects of working in clay. Everything large is just a little less impressive when finished. Oh well. Here's also a picture before it's decorated, with a little flower pot I made this week as well. Trimmed and decorated large bowl - the larger of the two here. There was a lot of clay left in the bottom of this one, I discovered while timming. I need a decent amount left in the bottom to put a nice foot on it, but this was significantly more than I needed. However, the last large bowl I did, the one that didn't survive, had less clay in the bottom then I wanted, which I'm willing to blame for its demise. I'm slightly disappointed that I left that much clay there, because it means that I probably could have pulled another inch of height and probably of an increase in diameter, but it's better to be safe than sorry. Here's the bowl, upside down, of course. Threw the pieces for a larger vessel. The one on the left (below) will sit on top of the other, and we'll have a decent sized pot without having to wrestle 19 pounds at a time. The advantages are just that - you don't have to center the same amount of clay, so the throwing process is theoretically easier, at least at this point in my life. The disadvantages are that it does take more time, more steps in the process. But then, it's not like throwing 2o pounds of clay is necessarily any faster. I may have to throw a new bottom section, as I'm not so sure I like this one - there's a lot of clay in the bottom half that shouldn't be there, which translates into it being wider and shorter than it needs to be. Even so, it may work out for me. It may just be a squatty little pot. So that's it - a pretty decent list of accomplishments for a mid-week turn in the studio. I also was able to get shots of my newest work, which will be added shortly. 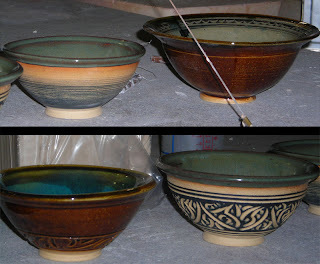 I'll leave you with a few of the bowls I threw for Empty Bowls, all glazed and finished. Of the empty bowls...I like the one top left....looks like a sunset or something...very pretty indeed...aldo like stage two of one of your bowls in the first picture....where it is partially decorated....of course the completely deco'd one is cool too....sounds like you had a productive night!! Good job!